Slice through the brisk waters of the Northwest in style. 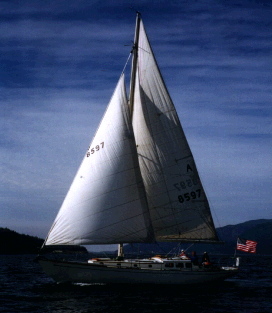 Aboard "Annie Too", our 45-foot Lapworth sloop, take in beautiful views of mountains and islands, watch eagles soar overhead and sealife in our waters. From Port Townsend, WA, enjoy 3-hour sailings for as little as $75 per person. Contact us today! Your browser does not support frames, which this site uses. To view the rest of this site, you must use a browser with frames, such as Netscape Navigator or Internet Explorer. Thank you.